Pittsburgh. The picture in my mind was gray and dismal and dull. Fortunately, my mind’s picture was way out of focus. The neighborhood around Carnegie University does stay awake after 5pm while the Pittsburgh Penguins host evening hockey games. Unfortunately, it is a city that has succumbed to the USA’s apparent disregard for city life. 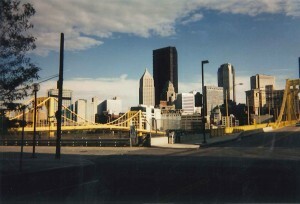 But while the city mostly shuts down at 5pm, there is still a lot to be said for Pittsburgh. It is the only city I can recall visiting with a museum about the French and Indian War; that is the war in which George Washington cut his battle chops. That museum is right next to a big park with a pretty and huge fountain in the downtown area. Nearby, you can take the funicular up the hill that took many factory workers between work and home over the years. The sumptuous homes of the factory owners/industrial magnates (Andrew Carnegie and Henry Clay Frick) are now museums that everyone can visit. If you check the back of the big local cemeteries, you will note lots of child graves. (Union organizers were fired and driven with their families from the factory housing leading to much hardship that was hard on young children in the cold winters.) If you check about, there may be a random lecture on organized labor in the USA. If you take a boat ride along the river, look to see the huge neon ketchup bottle advertising the local Heinz ketchup. The Andy Warhol Museum makes for a fun afternoon. (I have fond memories of meandering about a room filled with suspended pillows that swayed in a manufactured breeze.) But the best art find is in the City’s many, many bridges. The City, like most of Allegheny County, paints its steel bridges and trestles in pastel colors. That color where I am not expecting it, gives Pittsburgh a “grown-up Land of Oz” look. TATTOO—Journeys on My Mind by Tina Marie L. Lamb is available at Amazon.com and BarnesandNoble.com and Apple’s iBookstore.